I went to the cardiologist today for a followup on a previous visit and stress test echocardiogram. The verdict from the stress test: my heart pumps fine. (This is, perhaps, unsurprising. I'm relatively young, my family has no history of heart disease, and I lead a moderately healthy lifestyle.) Which is reassuring. But my symptoms still remain: shortness of breath, heart palpitations, fatigue after eating, etc. This has been my first personal experience with the medical establishment. I managed to stay away from doctors for the first 25 years of my life, except for the occasional mandatory check up. And I preferred it that way. Overall, the experience with the doctors has been pleasant enough, once I learned that specialists require scheduling appointments months in advance and an 8:45am appointment time means I'll be seen at 10:15am. 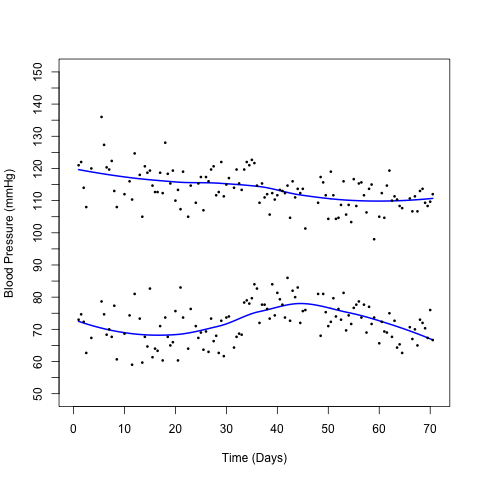 Each point corresponds to the average of three blood pressure readings taken over a ten minute period (thus, even this plot masks the variability inherent in blood pressure over small time windows), alternating morning and evening. The blue curve is a LOESS fit with the default smoothing parameter (I can't begin to imagine explaining \(k\)-fold cross validation...), mostly to guide the eye. Clearly, my systolic blood pressure (the larger number) has been declining, while my diastolic (the smaller number) increased for a bit and is now on the decline2. This change can be explained by my trip to Santa Fe: blood pressure tends to increase at higher altitudes. So, what was I supposed to say for my 'typical' blood pressure, again? I understand that medical doctors have a specific set of skills and knowledge. Skills and knowledge I can't even begin to claim. (I still have trouble distinguishing between my shoulders and my elbows. I keep thinking I should learn some basic anatomy and physiology. They've been added to the long list of topics I want to study but probably never will.) But it seems like, at least so far, diagnostic medicine is stuck in the dark ages. Which is why I welcome our robot overlords. It's funny (though perhaps not strange) that none of my complaints center around the usual things one hears about medicine. Probably because I'm currently covered by my parents' health insurance (until September, when I'll be too old for that), and have enough saved up to deal with these sorts of rainy day expenses. Honestly, I'd be much happier paying anything if I felt like medicine were practiced more like physics and less like haruspicy. I know I'm being too harsh on diagnostic medicine. I've seen too many episodes of House and read too many futuristic books about the biomedical singularity for my own good. I think that someday medicine will meet the expectations I have currently set for it. But today is not that day. ← Delta, Taylor, and Physical Chemistry — How do errors propogate?